Travel Coast Norsholm to Coast Mariestad with Nordic Saga Tours! The traditional route between Gothenburg and Stockholm, or, conversely, has been maintained since the shipping company founded in 1869. Our classic between the kingdom's two largest cities, where you can experience a journey through Sweden on the waterway with any of the traditional canal boats. Just the thought of that traffic on the canal has been going on for more than 140 years means that you will soon leave everyday life behind. This is an enjoyable trip where the road is more important than the goal. Occasionally we do go ashore, when possible, visiting historical or cultural places of interest along our beautiful waterways. You choose the course is always yours, if you prefer a guided tour of the country or to the peace and quiet to enjoy a drink on the aft deck. Welcome aboard for a journey beyond the ordinary. Here the canal crosses the main railway line between Stockholm and Malmö. 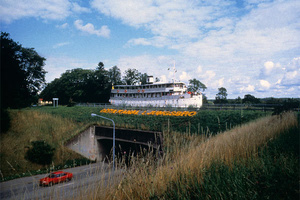 Our cruise Göta Canal Highligts with M/S Wilhelm Tham starts or ends in Norsholm. The Carl Johan lock staircase is the longest in the canal with seven connected locks. This lock staircase will raise the boat 18.8 metres from Lake Roxen to the Berg guest harbour. The tour guide will take us on a walk (app. 3 km) to see the Vreta Kloster church and the remains of the convent. As an alternative you can walk along the canal or take a refreshing swim in Lake Roxen. The convent of Vreta dates from about 1100 and was the first nunnery in Sweden. Its importance was later superseded by the convent founded by Saint Bridget (St. Birgitta) at Vadstena. The old convent church at Vreta is one of Sweden’s most interesting, offering many medieval treasures. Today, it is used as a parish church and is therefore not always open to visitors. We pass Karlsborg, which is located by the western shore of Lake Vättern. On the Classic Canal Cruise we visit the Karlsborg Fortress, which was initiated by Baltzar von Platen and built in 1819-1909. Here you can enjoy an interesting guided tour of the fortress and the beautiful Garrison Church. Forsvik is one of Sweden’s most interesting industrial communities. For six hundred years, iron has been worked, boards have been sawn and flour has been milled here. Historical buildings used for fine metalwork, a foundry and a wood pulp mill are found in this beautiful and unique environment. Exciting and informative displays tell about metalworking, engineering and life in this industrial community. 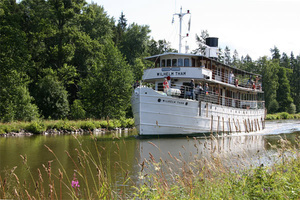 On the cruise Göta Canal Highlights with M/S Wilhelm Tham we get to enjoy an interesting guided tour. If we are lucky the paddle steamer Eric Nordevall II will be moored in the harbour. 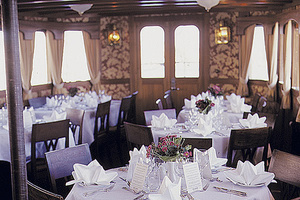 The paddle steamer is a full-scale replica of the Eric Nordevall, one of Sweden’s first power-driven ships. 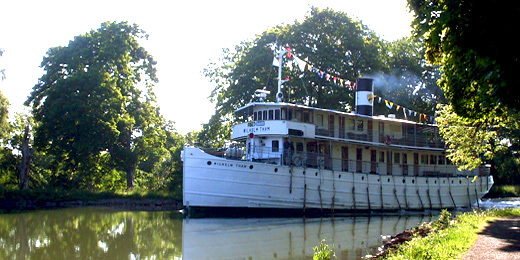 The paddle steamer was built in 1836, but sunk 20 years later in Lake Vättern. It was rediscovered in 1980 at a depth of 45 metres. The Eric Nordevall II was launched in 2009 and made its first trip in 2011. At Hajstorp there is a lock system consisting of four locks in beautiful surroundings. In 1822 the western section of the Göta Canal was inaugurated at Hajstorp. Here is the Canal Engineer’s home, now privately owned and the old smithy. Overnight stop. 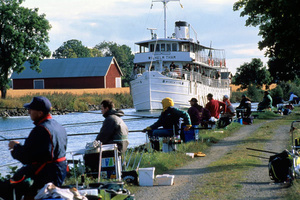 Our cruise Göta Canal Highlights with the M/S Wilhelm Tham begins or ends on the shore of Lake Vänern, in the city of Mariestad. The old part of Mariestad is one of Sweden’s most well-preserved wooden cities. The church tower is an impressive sight from the lake and on land. Hi, Dora. Thank you for recommending the trip on Gota canal. This trip across Sweden through numerous locks and beautiful lakes was so relaxing. The cruise staff was very helpful and courteous. All travelers were relaxed and friendly. The atmosphere was fantastic. The scenery was very beautiful and the food was gourmet. We took a few side excursions which were exciting and informative. The cabins were small, but very clean and just enough for 2 nights sleep. This trip was a very enjoyable possibility to see Sweden's countryside with beautiful and very tidy houses surrounded by flowers. I would recommend this trip to everyone. I loved it. Steve J. Bus departs from Stockholm, Radisson Blu Royal Viking Hotel, Vasagatan 1 (next to the Central Station and the City Terminal) at 09:00. 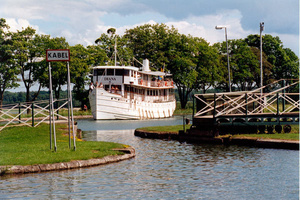 Boat departs from Söderköping at 11:30. Arrival in Gothenburg day 4 at approx. 16:00.